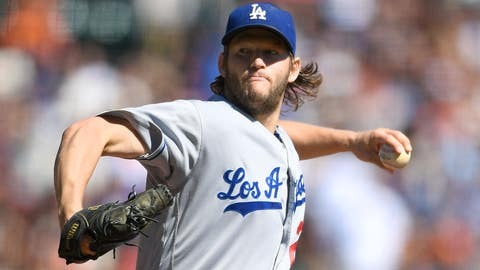 Clayton Kershaw torched the Nationals in WhatIfSports.com's L.A. vs. Washington NLDS simulation. According to our projections, the Dodgers win this series in 69.3 percent of our simulations, with a three-game sweep taking place 25.7 percent of the time. The Nationals only swept the Dodgers in 5.0 percent of the simulations. Despite his noted postseason failures in past years, our simulation engine has Clayton Kershaw dominating the series with a 2.18 ERA across all simulations. The Nationals on the whole struggled with lefties, as southpaw starter Rich Hill also posted a 2.50 ERA. The Nats aren’t projected to get quite the same production from their pitching staff, with Max Scherzer having the lowest ERA of any Washington starter at just 4.03. The Dodgers bats are projected to produce all series long, with the young duo of Corey Seager and Andrew Toles both batting over .300. As a team, the Dodgers batted .273 in our simulations and got an unexpected lift from Yasmani Grandal, who surprisingly led all hitters with a .77 HR per series average. Grandal’s power shouldn’t be underestimated, as he hit 27 home runs in just 390 at-bats this year and was among the league leaders in at-bats per home run. Leading the way for the Nationals in the leadoff spot was rookie Trea Turner, who hit .323 for the series. Since the beginning of August, Turner has been on fire and is hitting .348. Unfortunately for the Nationals, Turner just didn’t get the support behind him. Bryce Harper, who hit .203 in the month of September, is projected to hit just .205 in this series against the Dodgers.